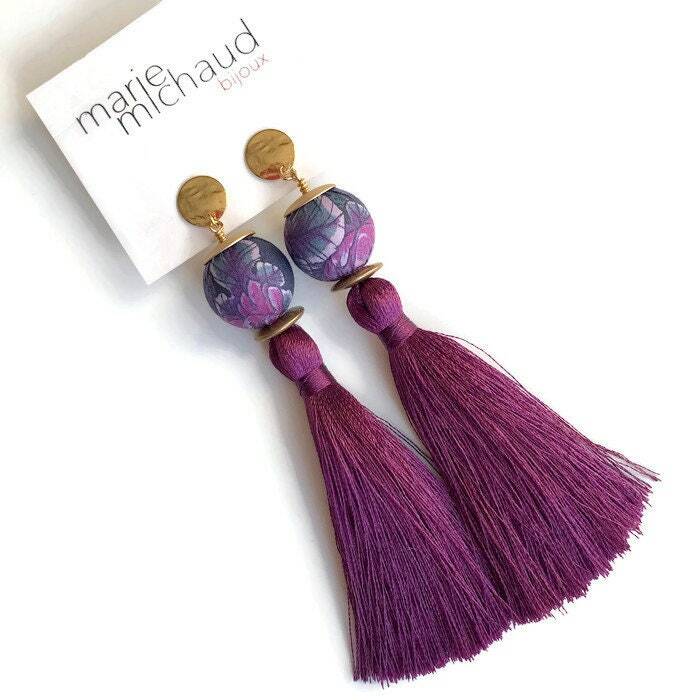 Long and original statement earrings made with beautiful purple silk tassels, unique hand crafted textile beads, brass components and ear studs. 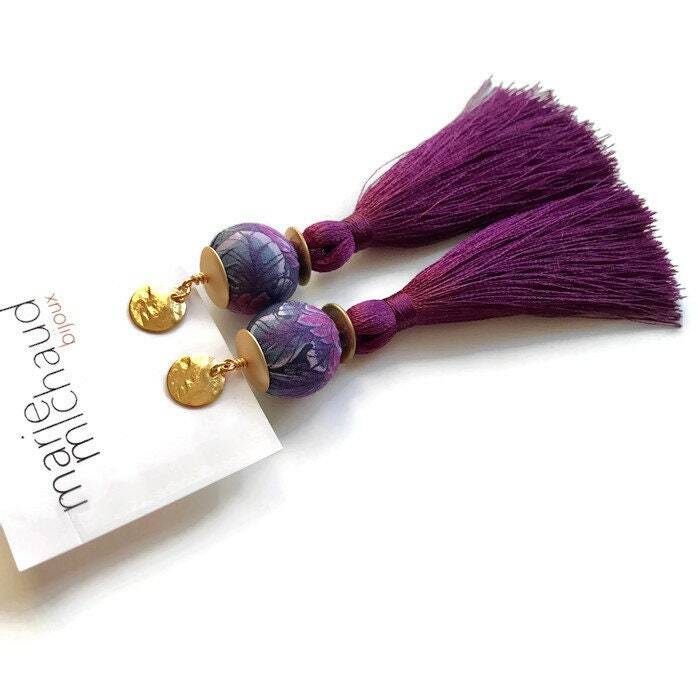 These statement earrings will bring a glamorous touch to your outfits! 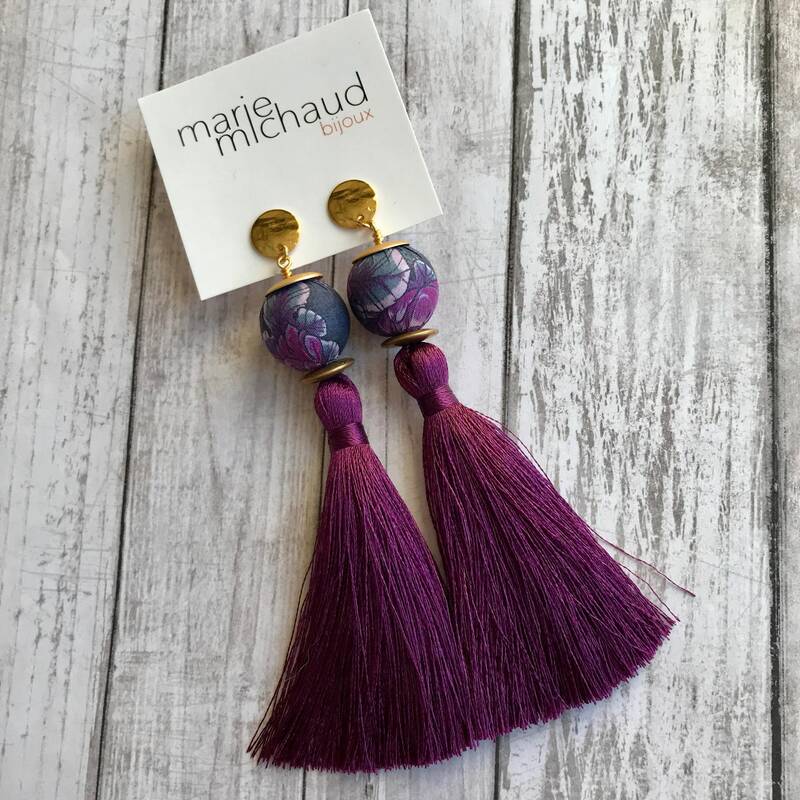 When you need to make a statement or when you want to bring an original and elegant touch to a chic and simple outfit, these earrings will be just perfect! They will also make a great present for a woman who likes colorful accessories and who likes to stand out from the crowd. 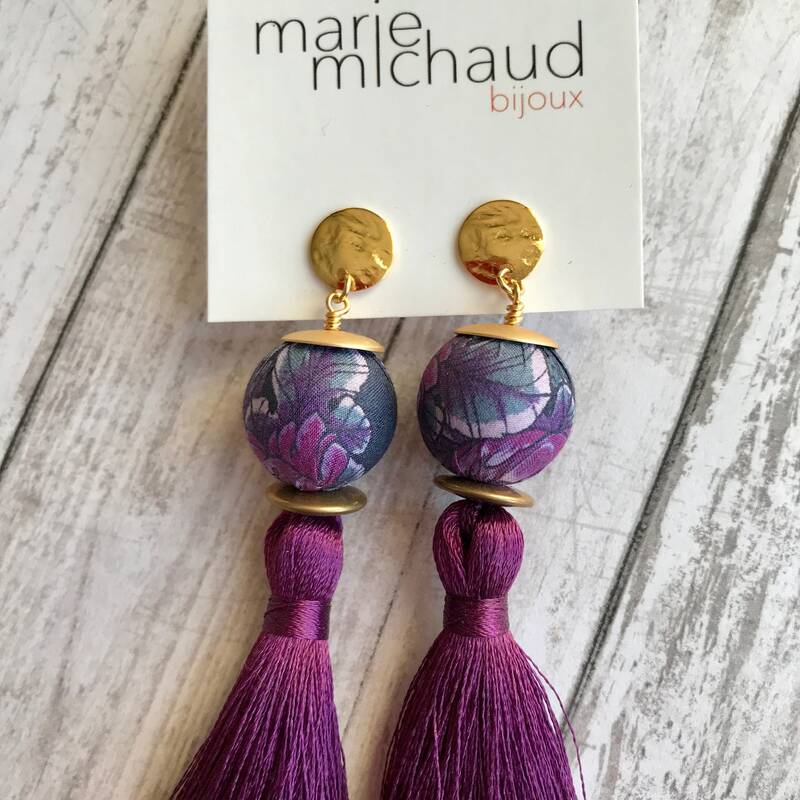 The earrings on the model are similar to the ones sold on this listing, only the colors and prints are different. The picture will let you see what they look like when worn. The textile beads are made with my own special technique! I use gorgeous Liberty-of-London Tana Lawn fabric. Tana Lawn cotton is unique. Made from specially selected ultra-fine cotton and finished without the use of crease-resisting chemicals or irritating allergens, the result is a famous masterpiece of fabric technology with brilliant reproduction of colors and prints! 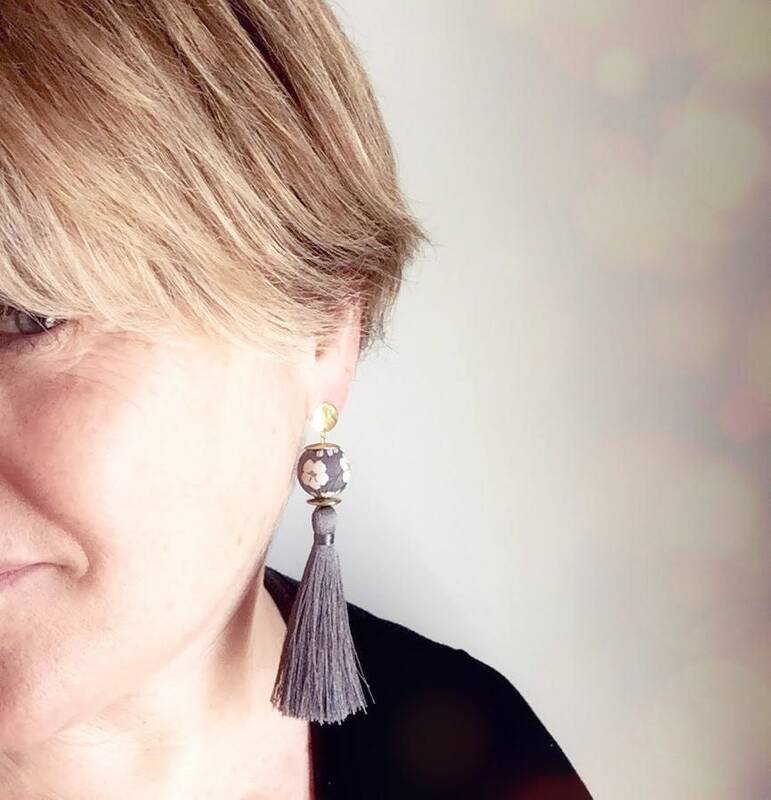 Please keep these earrings away from water, make-up and household products. However, the textile bead can be delicately cleaned with a wet washcloth and a little soap. 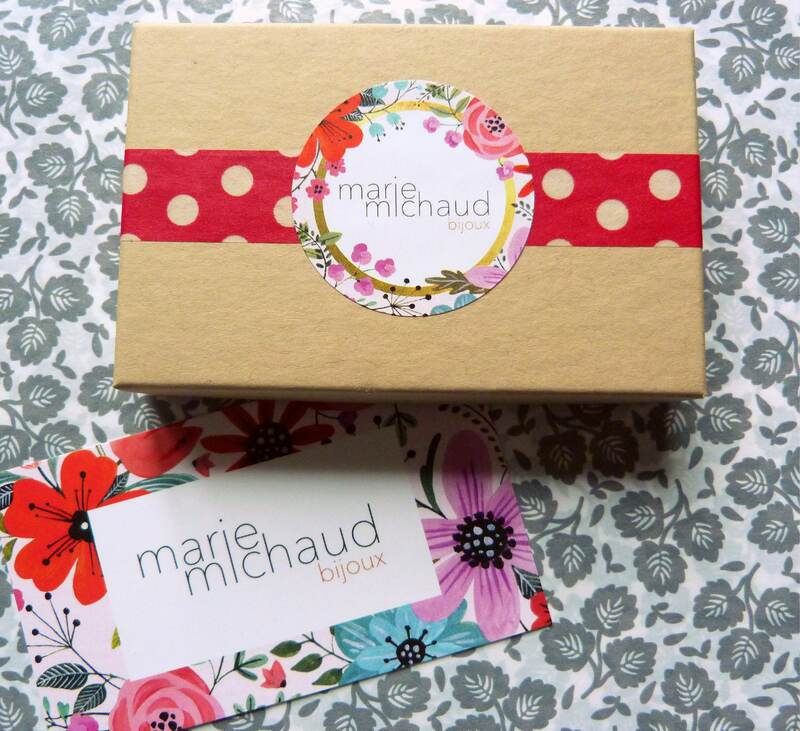 Free shipping everywhere in Canada! Nickel, cadmium and lead free. I accept Paypal, credit cards and gift cards payments. You must pay your purchase in order to confirm your order. If your payment hasn't been made within 48 hours after you have made your purshase it will be canceled and the items will be put back on sale. Only clients living in Canada can pay with a personal bank check. If you choose to pay with a personal bank check, please note that your purshase will be shipped upon reception of payment. Please note that the customers are responsible for possible additional costs of customs required by the authorities of their respective countries. Please make sure your delivery address is the same as the one indicated on Paypal. If it is not the case, do not forget to tell me which is the right address of delivery. I cannot be held responsible for delays caused by the various mail systems. According to the country, delivery deadlines can vary between 5 and 30 days. Please place your orders accordingly. Be reassured, most of the time the orders arrive within 15 days after the order has been made. I spend a lot time creating each piece of jewelry. I use quality material and I am very meticulous. However, if your purchase does not bring you complete satisfaction of if you receive it broken, I may offer to refund you. Refunds will be proposed on a case to case basis. The jewel must not have been worn and must be sent back in the same conditions it has been sent to you (box, padded envelope...) with 7 days after you have received it. All items will be sent gift wrapped. Most of the time, each article will be wrapped separately.